Yarn: a mishmash of lots of leftover bits and bobs of yarn including TFA permanent collection and OOAK colourways and the 2 pink's are Hedgehog Fibres. All the details on my Ravelry project page. Find Your Fade is such a showstopper of a knit! I felt a lot of pressure to do it justice with the FO shots. I was a little concerned. Because the shawl is so big compared to my petite frame I was afraid that I wouldn't have the wingspan to show it off in it's entirety. Luckily, the day we chose to take the photos and the location we happened upon by the waterfront featured the perfect conditions. It was windy! That was key. 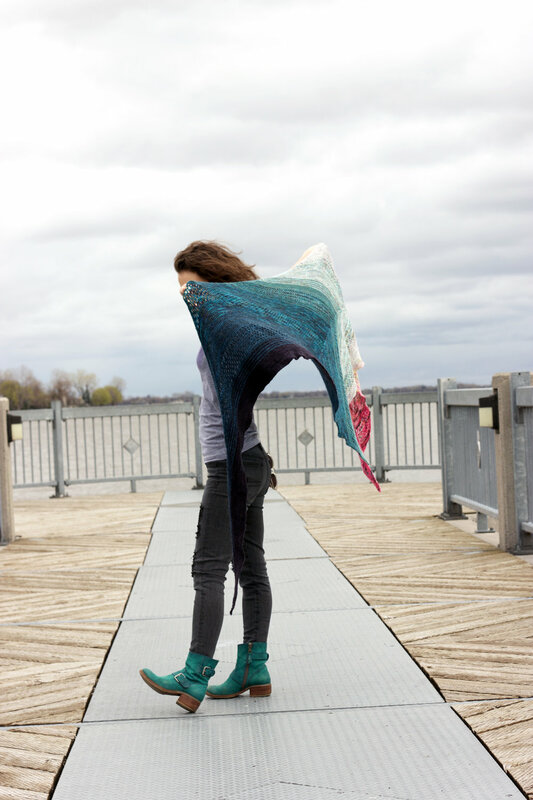 Just look at that gorgeous beast of a shawl billowing in the breeze! I absolutely love it! So, there is no denying it... this shawl is huge! I've read of others opting not to wet block it for fear of having it grow on them to even more enormous proportions, but I felt like wet blocking was absolutely necessary for me to lighten up all that garter stitch. It was a bit dense and stiff right off the needles, but a gentle blocking helped it to loosen up and drape beautifully. I didn't use blocking wires, I just laid it out and straightened the edges as best as I could without pulling or stretching. The leftovers from my Fade. Lots of future knitting fun still to be had with this palette! I'm insanely happy with the colour palette I chose. Choosing the right fade can be a daunting task. I certainly went through a couple options before settling on this one. I had it in my mind that for a dynamic and successful fade I needed 3 things: a bright (hot pink) a very light (light grey speckle) and a very dark (charcoal). I wanted there to be a ton of contrast and for the shawl to be dramatic and dynamic - no subtle fade for me! Once I had nailed down the vibe I was after it was just a matter of rooting through my stash and picking the few main colours (the 3 key colours mentioned above) and then finding the in between shades that would link them together. In my case that meant using 8 colours. The pattern specifies 7, but this is definitely the sort of pattern that allows for lots of customizing. It gives instruction for when and how to melt from one colour to the next, but working more or less of any of the colours is a piece of cake. I used a combinations of speckles, variegated and solid colourways and I'm really happy with how well they work together. I was able to crack into a few preciously hoarded skeins as well as use up some leftover partial skeins, which is always so satisfying! If I'm being perfectly honest I did struggle trying to figure out how to wear this beauty. I don't think that it's an issue of scale as much as it's an issue of wanting to show off the gradual colour shifts that unfortunately get lost when you wrap it around your shoulders a few times. I've come around to accepting that unless I walk around with my arms outstretched holding my shawl from tip to tip I'm not going to be able to show off the entire gradient in all it's glory while wearing it. Which is why I should just knit So Faded, because then the fade will never be hidden! This project has made me want to knit everything in a gradient. I've always been a fan of the ombré look. If you watched our latest podcast episode you'll have seen my steady stream of ombré knits throughout the years. I am so not over ombré! Find Your Fade is a big commitment. It's a lot of knitting and it results in a shawl that is potentially a little too big to be practical all the time... But! You will get stopped and complimented on it every time you wear it. Your kids will love it. Your friends will love it. You will be thrilled and excited at every colour switch and it will all be worth it. Also, you could easily make it smaller, but where's the fun in that? *At this point I do not intend to make kits for my Fade. I used so many OOAK colourways as well as 2 non-TFA colourways and I don't think I could reproduce it exactly. If you need help putting together your own TFA fade I'm always happy to help! 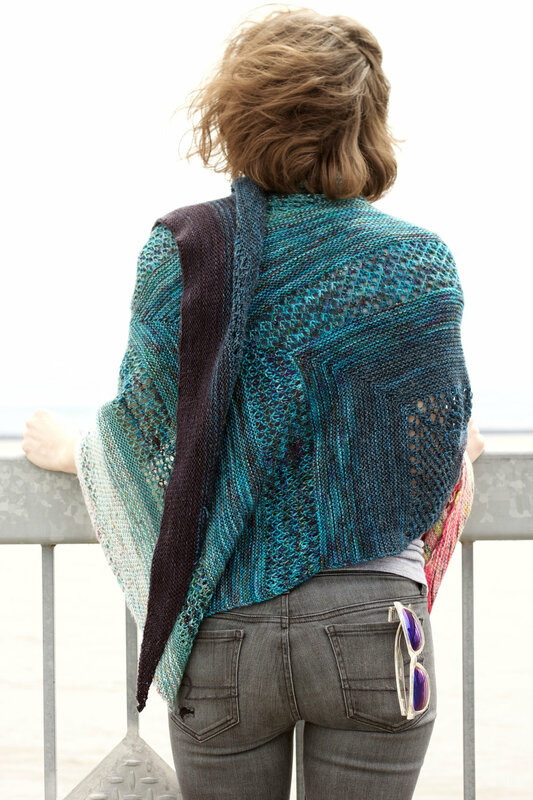 *Also, we'll have more So Faded Bundles very soon, which would make a great jumping off point for this shawl! So, have you found your fade yet? Do you plan on trying?